You want to know the most interesting thing to me about this picture? I had to literally lie down in the median on Wacker Drive to get low enough to take it. With full traffic zooming both ways around me I knew I was taking a bit of a risk. Of course other people might like the fact that this shot shows Chicago’s Marina Towers (my old home), the IBM Building (now changed to the AMA Building but forever the IBM if you’re savvy), the Trump International Hotel and Tower (or just Trump Tower), all in one shot. While Marina City, a residential complex was already in place enjoyed beautiful views in every direction when it was built, many of these have slowly been overtaken by other buildings rendered history. The IBM is one of these buildings. East facing Marina City residents once enjoyed beautiful views of the Chicago River, Lake Michigan, and Navy Pier until this black wall designed by Ludwig Mies van der Rohe was built right next to them thus obscuring that view. Now these residents enjoy a lovely black wall and if they go to the rooftop and look East they can look up above that black wall and see the very top of the Trump Tower peeking over it. 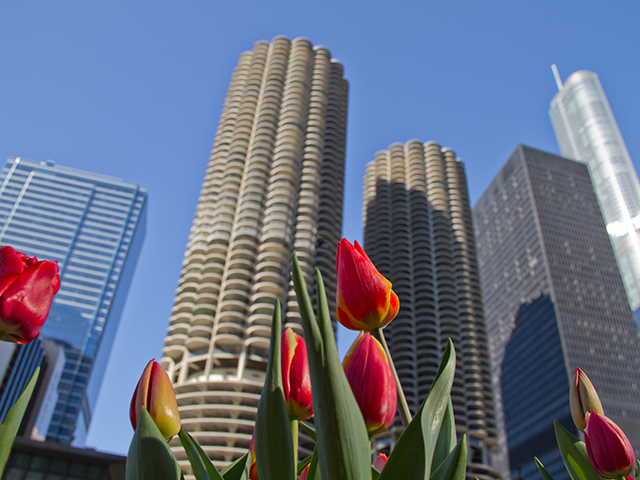 I’m quite sure this is not what architect Bertrand Goldberg had in mind for Marina City. I know many people hail van der Rohe as some icon of architecture, but I fail to harbor any amount of aesthetic attraction to his block like boring structures, personally. And that’s even after reading about him and going to the van der Rohe exhibit many years back at the Museum of Contemporary Art here in Chicago! But, that’s just me. Good thing I wasn’t on the committee to decide upon funding of his buildings! The Trump Tower, on the other hand, I genuinely love that structure. It’s sleek, shiny, and reflects all sorts of interesting colors as the sun plays on its surface. Besides, the walkways along the river at the base of the Trump make it a great place to sit and watch the world go by! Now, Adrian Smith, who is credited with the architectural design of the Trump Tower, clearly took into account the rest of the city and nearby structures while putting this idea together. I’d like to buy him a cup of coffee.